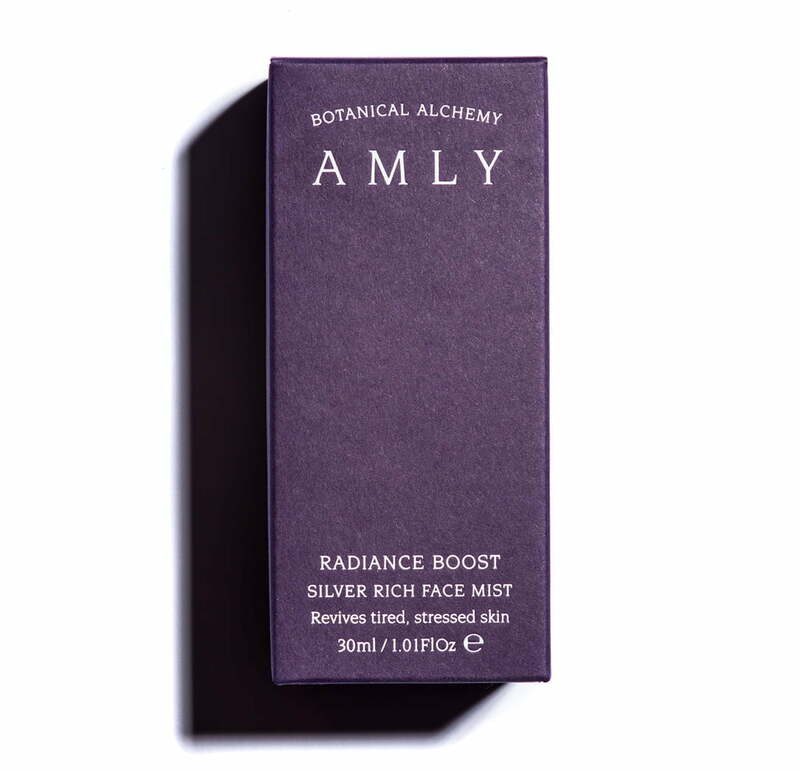 A revitalising face mist containing silver-rich spring water blended with organic flowers, hedgerow fruit, native British herbs and exquisite essential oils. The deeply hydrating mist is strengthened with moisture-boosting Hyaluronic Acid, skin-perfecting Copper Peptides and nourishing plant Probiotics. The uplifting scent will leave your senses fully awakened and your skin enlivened. Close your eyes and spray liberally on to face and neck. Breathe deeply to allow the aromatic oils to envelop and stimulate the senses, then enjoy radiant-looking skin. Spritz regularly to feed your face nutrients throughout the day. Hyaluronic Acid supercharges the skin’s moisture content by enabling it to hold 1000 times its weight in water. Skin-perfecting Copper Peptides are scientifically proven to protect against cellular DNA damage and stimulate collagen production. Pisum Sativum (Pea Peptide) has powerful antioxidant properties, hydrating and smoothing the skin. Olibanum Pure Gum oil (Frankincense) boosts the immune system against ageing. Neroli Orange Flower calms and settles the skin. It is anti-ageing and regenerating. Rose Otto is luxuriously nourishing, anti-ageing and helps blemishes to fade. Aqua, ***Citrus Aurantium Dulcis (Sweet Orange) Flower Water, Rosa Damascena (Rose Otto) Flower Distillate, Anthemis Nobilis (Roman Chamomile) Flower Extract, ***Aloe Barbadensis (Aloe Vera) Leaf Extract, Glycerin (Vegetable), Lactobacillus Ferment, Pisum Sativum (Pea) Peptide, Hibiscus Sabdariffa (Hibiscus Berry) Flower Extract, Vaccinium Myrtillus (Bilberry) Fruit Extract, Crataegus Monogyna (Hawthorn Berry) Fruit Extract, Sambucus Nigra (Elderflower) Flower Extract, Althaea Officinalis (Marshmallow) Root Extract, Equisetum Arvense (Horsetail) Extract, Hypericum Perforatum (St John’s Wort) Leaf Extract, Alchemilla Vulgaris (Lady’s Mantle) Leaf Extract, Achillea Millefolium (Yarrow) Flower Extract, Selaginella Lepidophylla (Rose of Jericho) Extract, Hydrolysed Hyaluronic Acid, Bis (Tripeptide-1) Copper Acetate, Leuconostoc/Radish Root Ferment Filtrate, *Citrus Aurantium (Neroli) Flower Oil, *Rosa Damascena (Rose Otto) Flower Oil, *Boswellia Carterii (Olibanum) Gum Oil, *Jasminum Officinale (Jasmine Absolute) Flower Oil, *Tilia Cordata (Linden) Flower Oil, *Anthemis Nobilis (Roman Chamomile) Flower Oil, Silver Citrate, Polyglyceryl-4 Caprate, Rapeseed Acid, Glucose, Hydroxyacetophenone, Dehydroacetic Acid, ****Pentylene Glycol, Citric Acid, Benzyl Alcohol, **Limonene, **Linalool, **Geraniol, **Citronellol, **Benzyl Benzoate, **Farnesol.